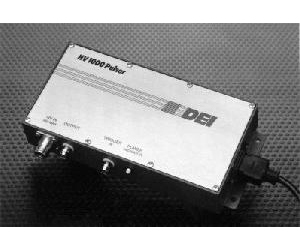 The HV1000 Pulser is a state-of-the-art high frequency, high power module designed to address numerous applications that require very fast and clean high voltage or current pulses such as driving laser diodes, instrument calibration, component testing, beam steering and gating PMTs and MCPs. The versatile and economical HV1000 features DEI'''s patented FAST POWER® MOSFET as the high voltage switch. Designed to operate into a load impedance of 50 Ohms, the HV1000 requires an external high voltage DC supply (950V maximum) and a gate signal. The output pulse width and frequency are controlled by the gate signal. The unit is available in either positive or negative polarity.